As any brand that respects its label, MINI revealed a new concept at the North American auto show. 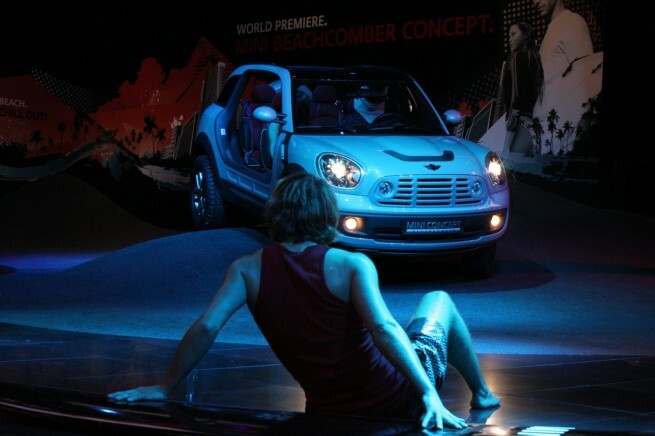 MINI Beachcomber, a Moke-line inspired ALL4 all-wheel drive and a preview to the upcoming MINI Crossover, had its world premiere in Detroit this week. While the Beachcomber will remain at the concept level, plenty elements from its design will be seen in the production crossover, minus the “doorless” approach as someone pointed out. MINI did mention that lightweight doors (lightweight has been emphasized throughout the show by BMW) and a soft roof will be available. While the BMW brand sales suffered more than one would want last year, MINI has done somewhat better: 6% down in 2009. As outlined in the press conference, MINI’s network of 90 dealerships, makes the U.S. market most attractive for the UK-based automaker. The MINI E trial program has been also extended in the U.S. for another year. The videos below will show you the MINI brand at NAIAS 2010, along with the press conference held by the charismatic BMW sales and marketing director Ian Robertson.